Americans appear to have shrugged off the sequester, but they wouldn't escape the pain of a default, a top White House economic adviser said Thursday. "I think this is of a different magnitude. 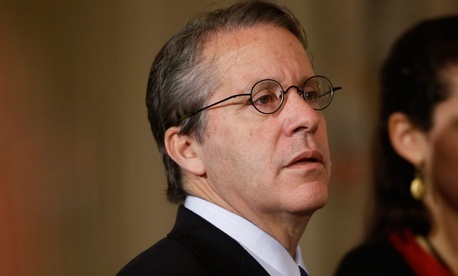 This is a different order of potential harm," said Gene Sperling, the head of President Obama's National Economic Council, said of comparing default to the sequester or the current government shutdown. "The sequester is very, very stupid policy.... A shutdown ... it's hurting real-life people, real-life children," Sperling said. "Neither of them risks having a frightening global economic event where things unwind and we are not there with the capacity to respond." Sperling is the latest in a string of administration officials and business leaders working to convince the public that default could precipitate an economic crisis, a notion that congressional Republicans have labeled as alarmism. If the administration is going to convince the public of the debt-ceiling urgency, they'll have to overcome the perception that the White House oversold the impacts of the sequester's across-the-board discretionary spending cuts. According to the latest United Technologies/National Journal Congressional Connection Poll, only 23 percent of respondents have "seen any impact of these cuts" in their communities or on them personally, while 74 percent said they had seen no impact from sequestration. Sperling maintained that the sequester is damaging, saying it was clipping growth in the gross domestic product by a half point and costs hundreds of thousands of jobs, but he said default would be far worse, both in terms of its immediate impact and its long-term damage to the country's financial reputation. Sperling earlier this week said the administration is open to a short-term increase in the debt ceiling, giving Republicans and Democrats a window to strike a larger deal on the budget and possibly tweaks to the health care law. And National Journal reported Wednesday that a growing group of GOP lawmakers were mulling legislation to push back the debt limit for four to six weeks.